Each product you sell on your online store can have options applied to it that a customer can choose when they make their selections for purchase. We call these options "attributes". Each attribute can be set up to add options that are free, and also ones that will add additional charges to the product price based on the selections chosen. You can add in up to 20 attributes per product, and you may create an unlimited number of options per attribute. An example of an attribute would be "Color", while the options for that attribute example may be "Red", "Green", "Blue", etc. Clicking on the "Submit" button and then "Update Attributes" link will save your changes from here. 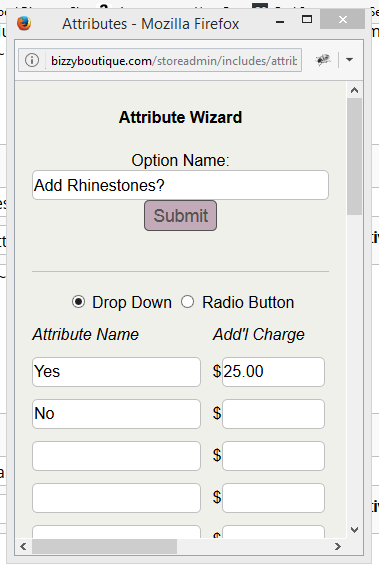 The attributes wizard works best for adding in a drop down menu, or radio buttons. For a text area, you will be able to create this on the main attributes page. You can also create checkbox and a memo field on this screen. A memo field is a larger text box entry area. Log into your store admin. Navigate to the "Products" link under "E-Store". Add a new product, or choose the product that would would like to add attributes for. 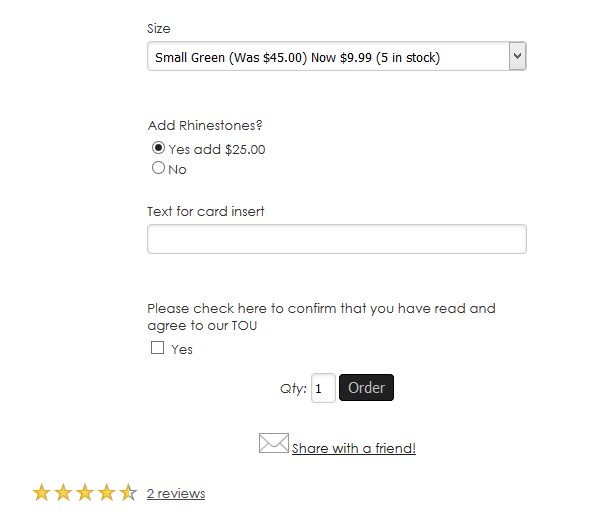 Scroll down to the bottom on the product create/edit page, and find the "Add Options" button. Click "Add Options". You will be able to add attributes on this screen. Be sure to save your changes. Instead of saving from the attributes page click the "add inventory" button. Set inventory quantities as directed. You can also set up "related products" from this screen. These items will show under the item you are creating as a way to direct customers to other, related things they may be interested in.